The Canadian MEDIA $600M BAILOUT Exposed! – What You NEED To Know! US Government Setting the Terms for Argentina's Bailout? December 16, 2017 is the tenth anniversary of the modern Tea Party. That fact will surprise many laypersons who uncritically accept the mainstream narrative that the Tea Party began on February 19, 2009 when Rick Santelli, live on CNBC from the Chicago Mercantile Exchange (CME), declared a rebellion against “socialism” one month into the Obama administration. But wait a minute: Rick Santelli on establishment NBC lighting the spark of an anti-establishment rebellion? An uprising over mere proposed Obama bailouts of mortgage holders coming four months after silence over (if not a defense of) George W. Bush’s $700 billion TARP bailout of Wall Street? If the mainstream narrative seems fishy, that is because it is. What really happened ten years ago and how was the Tea Party transformed from a libertarian grass-roots movement to today’s controlled (and just-about dead) establishment version? What are some of the lessons that can be learned? This post was published at Ludwig von Mises Institute on 12/18/2017. Can You Trust this Stock Market? Warning Signs Grow. Some of the same warning signs that emerged before the 1929 to 1933 market crash, the tech mania crash of 2000, and the epic Wall Street meltdown of 2008 are flashing red. If you have significant amounts of your 401(k) invested in equity mutual funds (that is, those invested in stocks), it’s time to take an objective appraisal of today’s market versus historic benchmarks. This is also a good time to remember that markets have lost as much as 50 percent of their value from peak to trough in the last 20 years. If that’s more pain than you’re prepared to suffer, it may be time to trim back your exposure. We’ll get to the specifics on today’s market shortly, but first some necessary background. In the market crash of 1929 to 1933, the stock market lost 90 percent of its value. It did not return to the level of 1929 until 1954 – a quarter of a century later. There is some basis to speculate that the bear market of October 2007 to March 2009, which included the epic Wall Street crash of 2008, would have produced far more serious pain than the 50 percent retracement in the S&P 500 that did occur – perhaps pain on the level of 1929 to 1933 – had it not been for the secret $16 trillion in almost zero-interest loans that the Federal Reserve Bank of New York sluiced into the major brokerage firms on Wall Street – which was on top of the hundreds of billions of dollars in bailout funds that were authorized by Congress. Got It Figured Out Yet? Why do you think the US Congress passed the Sexual Assault Taxpayer Bailout Act by unanimous vote in 1995 — and Bill Clinton signed it? Why has it not been repealed — and in fact, even today there is no bill on the floor of either House or Senate to repeal it, nor has Trump called for it to be repealed and stated he will refuse to sign any other bill (which is within his power) until it is? The Hollyweird cabal’s escapades are not just limited to harassment. We all know about the Michael Jackson allegations. Then there’s Epstein — and his connections to both the entertainment and political “industries.” Epstein, I remind you, was convicted and yet of all the people who I’ve ever read about being convicted of that sort of offense he’s the only one who was basically given a slap on the wrist instead of decades in prison. Worse, all of the others connected to him were not pursued. At all. Herr Clinton was of course one of those persons but hardly the only one. Number of prosecutions of those others? Zero. So let’s ask the inconvenient question: Is all of this in the political and media sphere nothing more or less than a monstrous blackmail scheme and that is why it never came out until it suddenly was forced into the public eye by some damning revelations that could not be silenced once they got circulating on Social Media? This post was published at Market-Ticker on 2017-12-07. The Yellen Put – Friend Or Foe? The term ‘Greenspan Put’ was coined after the stock market crash of 1987 and the subsequent bailout of Long Term Capital Management in 1998. The Fed under Chairman Alan Greenspan lowered interest rates following the fabled event of default and life continued. When the Federal Open Market Committee briefly allowed interest rates to rise above 6% in 2000, the US financial system nearly seized up. Long-time readers of The Institutional Risk Analyst recall that Citigroup (C) reported an anomalous spike in loan defaults that sent regulators scrambling for cover. The FOMC dropped interest rates at the start of 2001 – nine months before the 911 terrorist attacks – and kept the proverbial pedal to the metal until June of 2004. Since its financial meltdown in 2008 and unprecedented bailout by the U. S. taxpayer, Citigroup (parent of Citibank) has been repeatedly charged by its Federal regulators with odious crimes against its pooled mortgage investors, credit card and banking customers, student loan borrowers, and for its foreclosure frauds. It has paid billions of dollars in fines for its past misdeeds while new charges pile up. In 2015, it became an admitted felon for participating in rigging foreign exchange markets. In short, Citigroup is a lawbreaking recidivist. If it were a mere human, it would be serving a long prison term. Instead, its fines for charges of egregious acts are getting smaller, not larger. Adding further insult to the American public, the Board of Directors of Citigroup has kept the same CEO in place for more than five years as these serial abuses of the public trust piled up. Michael Corbat has been CEO of Citigroup since October 2012. This post was published at Wall Street On Parade on November 27, 2017. Once you provide a benefit it’s just very difficult to take it way. This sure seems to have become a bigger and more complex issue than it had been in the past. Taking away benefits is certainly front and center in contentious Washington with tax and healthcare reform. It is fundamental to the dilemma confronting central bankers these days. This post was published at Wall Street Examiner on November 18, 2017. Venezuela, the South American country convulsed by economic and humanitarian catastrophe, has defaulted on some of its debt after missing an interest payment due in October. Even as investors meet in Caracas to discuss restructuring US$60 billion in foreign debt, the country is in urgent need of international financial assistance. Yet few nations are rushing in to offer financial assistance to the ailing country. Under the authoritarian regime of Nicols Maduro, Venezuela is isolated in Latin America, and the United States, Canada, and the European Union have all imposed sanctions against Venezuelan officials. Maduro has at times suggested he would not even accept humanitarian aid. Still, no indebted nation is totally alone in this world. As a financial analyst, I know there are always international players who see opportunity in the problems of others. And for Venezuela, my home country, all hope of a bailout rests with China, Russia, and the International Monetary Fund. Will they do anything to help? This post was published at FinancialSense on THE CONVERSATION /1/15/2017. One of the most popular JPMorgan analysts, traders and commentators, Jan Loeys, head of global asset strategy and author of the weekly “The JPMorgan View” piece is moving on (to a different, non-client facing part of the company), and is using his last weekly address to JPM clients to recap the main lessons he has learned over his 30 year career. For those carbon-based traders who still trade on the basis of fundamental analysis, inductive reasoning, and discounting, and forecasting the future – instead of merely relying on the fastest laser-based algos to react to the news or hoping for central bank bailouts – we have excerpted the entire piece, and are excited to note that while Loeys may be leaving, he will be replaced by two of our favorite JPM analysts and commentators, Nikos Panigirtzoglou and Marko Kolanovic, who under John Normand will take over as JPM’s new Cross-Asset Strategy team. The theory and empirical literature of Finance are the best starting point as they deal directly with asset prices. Next are macro economics and statistics. Markets are not Math or Engineering, but a forever learning and adapting system with all of us observing and participating from the inside. Quantitative techniques are indispensable, though, to deal with the complexity of financial instruments and the overload of information we face. Empirical evidence counts for more than theory, but you need theory to constrain empirical searchers and avoid spurious correlations. This post was published at Zero Hedge on Nov 12, 2017. Over the past year we have provided extensive coverage of what will likely be the biggest, most politically charged, and most significant financial crisis facing the aging U. S. population: a multi-trillion pension storm, which was recently dubbed “one of the most heated battles of a lifetime” by John Mauldin. The reason, in a nutshell, why the US public pension problem has stumped so many professionals is simple: for lack of a better word, it is an unsustainable Ponzi scheme, in which satisfying accrued pension and retirement obligations requires not only a constant inflow of new money, but also fixed income returns, typically in the 6%+ range, which are virtually unfeasible in a world where global debt/GDP is in the 300%+ range. Which is why we, and many others, have long speculated that it is only a matter of time before the matter receives political attention, and ultimately, a taxpayer bailout. That moment may be imminent. According to Pensions and Investments magazine, Democratic Senator Sherrod Brown from Ohio plans to introduce legislation that would allow struggling multiemployer pension funds to borrow from the U. S. Treasury to remain solvent. The bill, which is co-sponsored by another Democrat, Rep. Tim Ryan, also of Ohio, could be introduced as soon as this week or shortly after. It would create a new office within the Treasury Department called the Pension Rehabilitation Administration. The funds would come from the sale of Treasury-issued bonds to financial institutions. The pension funds could borrow for 30 years at low interest rates. The one, and painfully amusing, restriction for borrowers is “they could not make risky investments”, which of course will be promptly circumvented in hopes of generating outsized returns and repaying the Treasury’s “bailout” loan, ultimately leading to massive losses on what is effectively a taxpayer-funded pension bailout. This post was published at Zero Hedge on Nov 9, 2017. 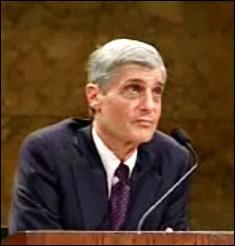 According to the now publicly available transcript of the testimony that former U. S. Treasury Secretary Robert Rubin gave before the Financial Crisis Inquiry Commission (FCIC) on March 11, 2010, he was not put under oath, despite the fact that the bank at which he had served as Chairman of its Executive Committee for a decade, Citigroup, stood at the center of the financial crisis and received the largest taxpayer bailout in U. S. history. The fact that Rubin was not put under oath might have had something to do with the fact that he showed up with a team of six lawyers from two of the most powerful corporate law firms in America: Paul, Weiss, Rifkind, Wharton & Garrison and Williams & Connolly. One of Rubin’s lawyers from Paul, Weiss was Brad Karp, the lawyer who has gotten Citigroup out of serial fraud charges in the past. To many of the questions posed by Tom Greene, Executive Director of the FCIC, Rubin responded ‘I don’t remember.’ Rubin used that phrase 41 times during the interview. This post was published at Wall Street On Parade on November 8, 2017. Wishful thinking may not be enough. The financial markets have been exceedingly calm in Italy of late. At the end of October the government was able to sell 2.5 billion of 10-year debt at auction at a yield of 1.86%, the lowest since last December – an incredible feat for a country that four months ago witnessed a major bank bailout and two bank resolutions, and that has so much public debt that it spends 70 billion a year to service it, the world’s third-highest. And there’s the ECB’s recent decision to slash its bond buying from roughly 60 billion a month to 30 billion as of Jan 1, 2018. Then there’s the over 432 billion of Target 2 debt the government owes the ECB, the growing likelihood of political instability as elections approach in 2018, the recent referendums for greater fiscal and political autonomy in Lombardy and Veneto and serious unresolved issues in the banking sector. Monte dei Paschi di Siena may still be alive as a bank, but it’s not out of the woods. Last week its stock resumed trading after ten months of being suspended from Italy’s benchmark index, the FTSE MBE. Shares opened on Wednesday at 4.10, then rose 28% to 5.26. But it didn’t stick. On Friday, shares closed at 4.58. It’s a far cry from the 6.49 a share the Italian government paid in August when it injected 3.85 billion into the bank to keep it alive. It spent another 1.5 billion shielding some of the bank’s junior bondholders, whose debt was converted into equity. As part of the rescue, the Tuscan bank was forced to present a plan to cut 5,500 jobs and close 600 branches until 2021, in addition to transferring 28,600 million euros in unproductive loans and divesting non-strategic assets. Investors clearly have their doubts. This post was published at Wolf Street on Nov 5, 2017.